Cosmetic Acne is treatable through a variety of proven procedures and medications. If you’re suffering from acne, Dr. Michalak can recommend a variety of treatment options at his Issaquah practice. The first line of defense against acne is a daily medical cleanse treatment. 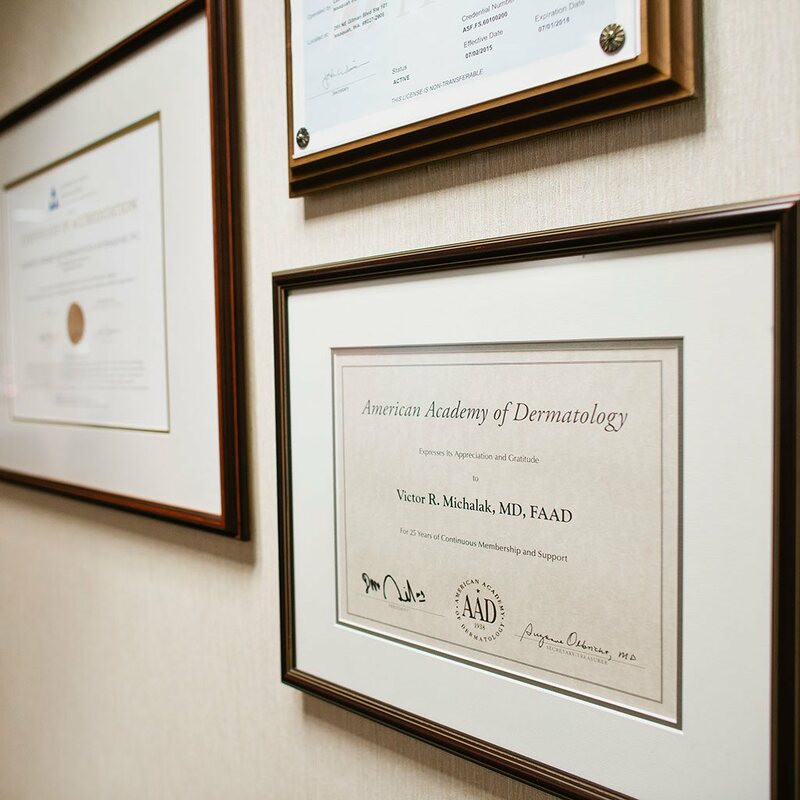 At Cosmetic Surgery and Dermatology of Issaquah, patients can receive a custom program to address acne – whether it’s an occasional pimple, long term, or severe acne and scarring. The best acne treatment plan is chosen based on factors such as the acne type, severity, skin type and area(s) affected. Most acne treatments are quick, painless and noninvasive. Results are further improved when you add effective medical grade skin care products. Once your acne breakouts are resolved, additional acne scar and hyperpigmentation treatments may be performed to further improve the appearance of your skin. This may include laser treatments such as Fraxel Laser. Comedones are either open (blackheads) or closed (whiteheads). Blackheads appear when oil, bacteria or dead skin cells partially block a hair follicle. They often take longer to clear. Blackheads appear black in color, not because of dirt, but because skin cell pigment reacts when exposed to oxygen. Whiteheads appear when the pores are blocked completely. They usually clear away faster than blackheads and exhibit a white surface. Pustules (pimples or zits) are inflamed lesions that appear due to clogged pores. Papules are also inflamed, red and tender but do not exhibit a head. Cystic acne (acne nodules) is associated with more severe acne and results in large, painful bumps beneath the skin’s surface. Nodules are known to cause acne scarring. Acne occurs when pores and hair follicles become clogged with excess oil, dead skin cells or bacteria. If you have naturally oily skin, you may be predisposed to acne. For others, greater exposure to bacteria is the cause of their acne. Hormones also affect the skin and may also lead to acne development. Thus, the onset of puberty, pregnancy, menstruation and hormonal birth control methods may trigger an acne breakout. Do you have questions about acne treatment? Contact the Issaquah dermatology practice of Dr. Victor Michalak to learn more about the options available. We frequently meet with patients from Issaquah, Bellevue and the greater Seattle area. Please dial 425-391-2500 to make an appointment.